A brutal civil war in Congo has displaced more people in the past year than the wars in Syria and Iraq. Who’s fighting? A political crisis that has simmered for decades has exploded into a new civil war, engulfing south-central Congo in mass butchery and chaos. Since October, at least 3,400 people have been killed in the Kasai region, and in such gruesome ways that more than 1.3 million people have fled their homes in terror. “My team saw children as young as 2 whose limbs had been chopped off,” said U.N. High Commissioner for Human Rights Zeid Ra’ad al-Hussein. “Many babies had machete wounds and severe burns.” The government of President Joseph Kabila appears to be behind some of the atrocities. After the rebel faction Kamuina Nsapu rose up last fall against Kabila’s government, both the Congolese army and the rebels engaged in atrocities. But the most horrific attacks in recent months have been the work of a new militia, Bana Mura, which the U.N. says was created and armed by Kabila’s government. Bana Mura militants, of a different ethnic group than the Kamwina Nsapu, have slaughtered whole villages, going door-to-door and killing everyone they found— babies, parents, grandparents. 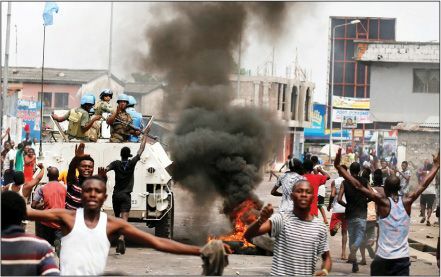 Kasai province is dominated by opponents of the government in Kinshasa. Last summer, the government appointed Kabila loyalists to key local posts rather than Kasai’s tribal chiefs. Local leader Kamwina Nsapu, a convicted diamond trafficker, led an uprising, with a militia named after him and composed largely of children and teens. Government soldiers killed Nsapu last August, but his fanatical militia began attacking government buildings, and the Congolese military fought back with unchecked brutality. The U.N. has more than 20,000 peacekeepers in Congo, but they are based mostly in the east of the vast country, and so far they have not intervened in the Kasai conflict. Why are the peacekeepers there? Congo has been a violent, unstable nation ever since the 1994 genocide in neighboring Rwanda. In that civil war, Hutus slaughtered Tutsis en masse, killing some 800,000 people in three months. Later, defeated Hutu fighters fled to Congo (then known as Zaire), where dictator Mobutu Sese Seko gave them sanctuary. Angered by the Hutu’s continued attacks, Rwanda invaded Congo and helped guerrilla Laurent Kabila overthrow Mobutu in 1997. But within a year Kabila had fallen out with his patrons. In 1998, Rwanda invaded Congo again, and the turmoil drew in five other countries battling for control of Congo’s vast mineral wealth. The conflict known as Africa’s World War formally ended in 2003 after some 5 million people were dead, mostly of disease and famine. Laurent Kabila was assassinated, and his son Joseph succeeded him as president, but has failed to consolidate control over the central African nation, which is nearly as large as all of Western Europe. Not directly, but U.S. companies are. Impoverished Congo has $24 trillion worth of mineral wealth in the ground, including cobalt, diamonds, gold, and coltan—a highly valuable ore containing the heat-resistant element tantalum, used to make the circuit boards in smartphones, laptops, and other electronic devices. The proceeds, often made off child labor, fund the rebel factions and the Congolese military—much as “blood diamonds” did in Sierra Leone. U.S. companies participate indirectly, by buying tantalum and circuit boards, and directly, by investing in Congolese mining: Just last year, U.S. hedge fund Och-Ziff Capital Management was hit with a record fine of $412 million for bribing Kabila for mineral concessions.